So it didn’t make a lot of sense that when I spent some time in Asturias, on the northern coast of Spain a few years ago that I felt so profoundly and deeply at home there. And at home with the people I was with too. It wasn’t the percebes, the rare and extravagantly delicious goose barnacles, or the grilled oranges or the jamón. The landscape there is distinctly un-Spanish. Rocky, lush, green. It feels more like coastal Ireland there. Asturias has a tradition of cider making and drinking more than wine and also has a traditional instrument there that might as well be a bagpipe. And that shouldn’t be a surprise because the Celts lived on all sides of the Cantabrian Sea – Spain, Portugal and France to the east and west and England and Ireland more north. 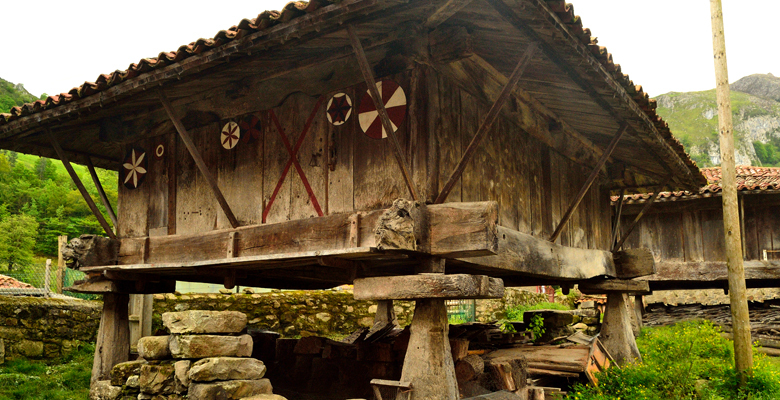 In a band of northern edge of the Iberian Peninsula lives a relic from older times – the hórreos – the platformed granary. You’ll see them in small towns and buried on hills that you see from the roadways. The oldest ones are from the 14th century but certainly the tradition is much older. The idea is simple – put your grain in a store house on a platform and make it virtually impossible for rodents to climb the legs by making a huge outcropping that they couldn’t scale backwards and upside down. These vestibules are of all kinds of sizes – big and small, high and low. Some are big enough to hold church services under. Largely these vestibules are not used anymore for storing grain. They are a point of civic and historic pride mostly now. Their food mostly comes from …away. But there they are dotting the landscape reminding the residents, and perhaps us too, that there was a time when Asturians were amidst and in the presence of the fruit of the land. There are signs that once what was needed to survive was at hand and we used our hands to cultivate a relationship to it. These granaries might be a reminder to keep such things close to you in your days. The last Neaderthals lived in Western Europe only about 1100 generations ago. Perhaps some most distant ancestor of mine walked those crags, swam those waters and ate the wild grain that would one day be harvested by Asturians. Maybe that is why the place felt like a place worth fighting for. Primal Derma might also serve as a kind of reminder that there was a time when we were close to cows and when they were taken by slaughter or by old age – their fat was part of the wealth of the land. If you need a bit of fat to remind you of that old relationship – we would love to send you some.